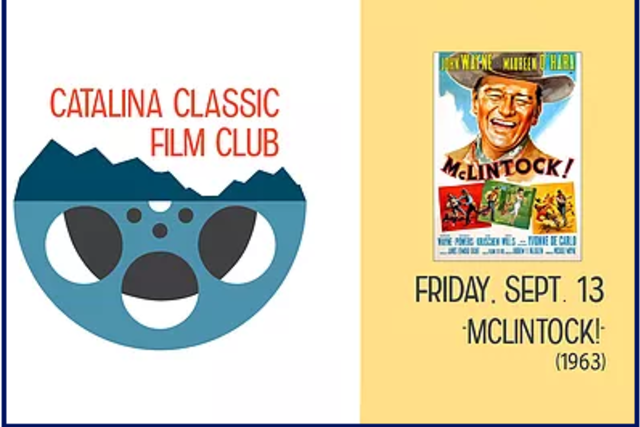 The Catalina Classic Film Club meets quarterly to bring together enthusiasts looking for an opportunity to enjoy films of yesteryear in an intimate setting. Tickets to the 24-seat venue are available on a first-come, first served basis with ticket sales beginning at 6:00 pm on the night of the performance. Refreshments will be available for sale. Join us for a screening of the film McLintock! starring John Wayne and Maureen O'Hara. In this comedy/romance western adventure Wayne plays G.W. McLintock a cattle baron and the richest man in the territory. He uses his power and influence in the territory to keep the peace between farmers, ranchers, land-grabbers, Indians and corrupt government officials. When his estranged wife and headstrong daughter return to the ranch, he tried to keep it all together.